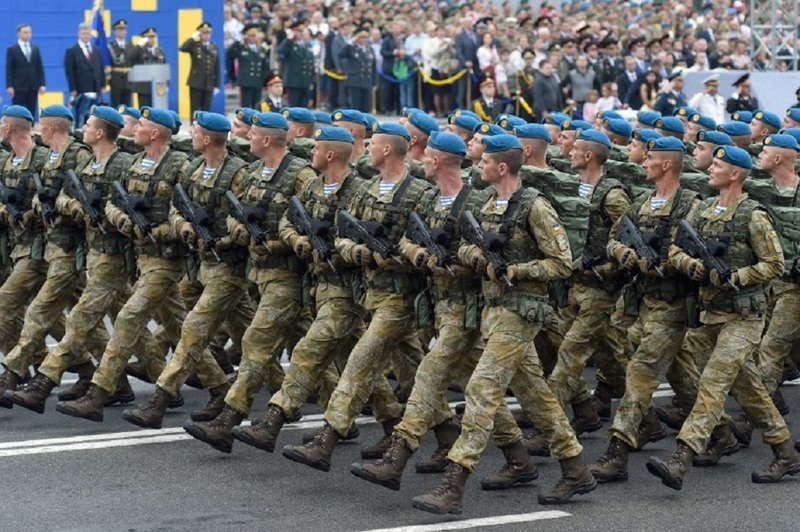 Ukrainian servicemen march during a military parade in Kyiv on August 24, 2016 to celebrate the Independence Day, 25 years since Ukraine gained independence from the Soviet Union. The article was originally published at Kyiv Post. By Glen Grant. Putin must destroy Ukraine as it exists now. To leave it intact is to destroy himself and his ambitions. He must win because of his war crimes: the mass graves, the torture in Donbas and Crimea, and the MH17 shootdown. All will put him firmly into The Hague as a war criminal. He must win because Ukraine is flourishing as a nation and it shows him as a failure. He must win because the truth will destroy him and Russia. Putin must invade or subdue Ukraine. He is not yet ready, but the evidence of his preparation is stark. He continues to reinforce, fight and kill in the Donbas. He continues to test new equipment, people and methods in Syria. He reinforces Crimea. He reinforces Kaliningrad to block Western reinforcement. He stockpiles equipment in Belarus. He continues to reequip the army, especially with tanks and modern technological systems. All this is far beyond any peacetime needs. He spends precious national money on the military he needs elsewhere. He continues to train for a strategic war in the west – which means Ukraine cannot escape this and will be a prime target. The Russian MOD says openly in the media that they need three more years to reequip the army in western Russia with tanks and to train troops. This time must not be wasted by Ukraine. What is Putin doing now strategically with Ukraine? Firstly, he has tied the Ukrainian army down, and is slowly bleeding it of morale and ammunition. He wants to breed a feeling of helplessness. He is playing political games with the West around Minsk and peacekeepers that blinds other nations to the real game. Other countries probably do understand, but they are too frightened of the political and financial consequences of rearming. The United States, Poland and the Baltic states alone are taking this threat seriously. The rest wait and hope it will all go away. Even NATO is only half-engaged as it fails to politically address the military weaknesses of countries like Bulgaria. But hope, sadly, is not a valid military doctrine. Putin also tries to break up the West further as a political grouping, reducing the chances of political support and reinforcement when he does act. He is having success in this. The current thinking of national leadership, shown by word and action, is that the “war is in the Donbas and will only ever be in the Donbas”. This is the most dangerous political and military problem for Ukraine. Putin wants and needs it to be like this. Europe and the United States want and need this. Putin is quite happy to waste Ukrainian human capital in the Donbas on both sides whilst he prepares his forces for a bigger game. The recent exercise of aircraft landing on main roads in Russia shows a level of seriousness few NATO countries match. The separatists are just cannon fodder. Their task is to be “buyers of time” whilst Russia prepares. They are also part of the Russian stratagem. Ukraine’s senior military act as if they believe they are winning because they are fixated on their successes in this very limited tactical war. They and the Defense Ministry are missing the point, because they are not preparing fast enough for a strategic and operational war that would likely be outside the Donbas and would give no time to mobilize large reserve forces. The country is losing the bigger game because of this, and whilst becoming stronger tactically at static war, overall Russia is moving faster and gaining a strategic advantage. For soldiers to be forced to stay in one defensive position like Minsk demands is always militarily wrong, because it gives the enemy the strategic advantage. Russia is taking advantage of this fact daily. Losing the strategic advantage is the greatest failure of any national or military leadership (read any military strategist – they all say the same – to hold a fixed defense is to break time-honored military rules). Russia can identify where the troops are weak and go through or around. Ukraine’s military position in the Donbas is at a critical risk of encirclement, which is a common Russian strategic act. Russian troops practice this tactic regularly during exercises. Trench warfare also breeds an entrenched mentality among soldiers and staff, which is against all rules of war if you want to win. There may be no alternative politically to accepting Minsk, but it must be seen for what it is; a stratagem to keep the Ukraine army tied down and focused on one point. Russia is succeeding all too well in this. The Ukrainian Army gets better every day, but overall it is not one of the best in Europe because it has some critical organizational flaws. Giving the army Javelin anti-tank missiles will not remove those flaws, and may even make them worse. People are confusing amazing bravery and minor tactics with operational and strategic ability. Operational ability is the ability to deliver force anywhere and win battles. Ukraine does not yet have this ability. Strategic ability is having a clear national goal and then creating the means to conduct operations where they are needed to achieve that goal. Ukraine’s government does not have this thinking logic, either nationally or within the Defense Ministry and the staff. The military cannot do active operations at the operational level because they are not structured for this, and they are certainly not practicing it. However, today Russia is practicing mobile battalion group operations hard. For Ukraine’s forces to stay as they are physically and mentally in the current military posture is to risk certain defeat if the battle becomes mobile – which it likely will. There must be strategic, operational and structural changes to the army. What does this mean? The army is very good at what it does now. But it has not practiced changing to another style of warfare, as U.S. forces are doing now. This is because there is no doctrine, equipping and training for doing this. The vision of a mobile army is lacking at all levels. The army is weak in terms of quality of senior commanders and headquarters staff and critically weak in communications, logistics and medical. They would struggle if there were two or more fronts to support. An example is food, which is supplied to the current front line under contract and could not survive an operation like Ilovaisk or Debaltseve if it lasted for two or three weeks. Troops would starve. What to do? First, the army must become active by order, because being passive destroys the army’s spirit: A new strategic set of orders is needed to encourage units to dominate the ground in front of them day and night. Battalions must be encouraged to destroy any Minsk banned equipment that are out of compounds, and kill any Russian units that attack them within their area of responsibility. They must dominate the night, redesign the command systems, communications and artillery to become super quick at responding accurately when the enemy attacks. Self defense is the highest legal authority available to any country, so active defense is legally every soldier’s right. General orders should state that after every Russian attack there is to be a strong counter attack at the point of battle or elsewhere on the front. The enemy is the same all over, so defense cannot be geographically limited by law. New ground should be taken and a new forward positions made. Ensure engineers are ready to support this. Move forward in small steps and punish all Russian aggression. Only Russia benefits from the current posture. Give the navy preparation orders to train to sink the entire Black Sea fleet in Sevastopol, the Russian oil rigs in Ukrainian waters and destroy the Kerch Bridge by any hybrid means possible. They may never have to do this, but preparation and training is everything for morale. Prepare the marines to defend against a sea invasion against Odesa or behind Mariupol. They need a clear war task to get their morale back until the housing issue is fixed. The navy needs stretching mentally by being engaged, and training. The air force needs to train with brigades regularly. Every brigade should have ground to air communications and a full time air liaison team. Brigades need to be trained to move quickly to new locations. Brigades should prepare defensive plans to fall back and fight in different locations. Brigades must learn to do this as a joint unit and without needing detailed sector orders. But the new battle areas and plans must be ordered and practiced regularly by brigades, sector commanders and staffs. All commanders must know what to do in an emergency if they have to advance, fall back or move to a totally new location in extreme circumstances. Logistic plans must be prepared to support change and a fluid battlefield, not just steady-state trench warfare. A mobile battlefield needs mobile HQs. The sectors and ATO HQs are static and thus high value targets. The sector HQs need to move out of their current locations into the field and become vehicle-mobile HQs. They should move position every week. Organizations must not rely upon power from electrical grids but must have their own generators. Sector commanders should only be those officers who have successfully commanded a brigade. They should be left in command until Ukraine either wins or they get promoted. The sector staff should be changed for young battle-trained officers (captains and majors) and men from battalions. Reorganize the sectors as divisions. The ATO headquarters also needs to become fully mobile and should be moved every 2-3 weeks to a new location. The ATO commander should always be someone who has successfully commanded both a brigade and a sector. He should be left in command until he fails or is promoted. No commanders at any level should be appointed who have not already commanded troops in battle. The ATO staff should be changed for young active officers (majors and Lt Colonels) from the battlefield, and with the best officers who are currently in rear HQs or even those who have already retired. Make the ATO HQ properly joint with the Army, Air Force, Navy, SBU and National Guard. The ATO HQ should be called a Corps headquarters. The current practice of manning the ATO HQs from rear staffs is bad, because it creates two armies: the fighting army of the Donbas and the staff army of the rear. They do not share the same moral or value codes. Advisers hear about this divide every day. This is dangerous for the country, as it will be exploited by Putin and should be changed urgently. The current combat logistics system has not been properly repaired. The old system of territorial defense meant that much of the brigade support was removed and has not yet been replaced. This is especially so in things like food, fuel and ammunition resupply systems, medical and forward maintenance. The current system is not designed to support a mobile battle in any way. You cannot properly logistically support a battle from an office 400 kilometers away. It does not work. Operational logistic support and planning must be close to the battle and under command of the battle commander. This is a military principle. There needs to be a proper Logistic ATO Deputy Commander position created for the corps/ATO, and with this a proper logistic HQ and staff created in Dnipro to support the battle area. The logistics commander should have command of all ammunition, logistic transport and supply units, medical, repair and military police for the Corps and all the supply depots in or close to the battle area. He should have clear orders and authority to supply and maintain the force and have authority to demand immediate purchase and resupply of critical supplies, without going through the general staff. Each sector should have a proper logistics organization to support Brigades The United States should be asked to set up a logistic officer’s course within Ukraine and ensure all battalions and brigades have someone who has done this. The Joint HQ in the Defense Ministry should be made into a proper war HQ, with the very best Strategic Commander in charge as soon as possible. This is in the new as yet unsigned defense law. It should not wait until then for action. The operational commander should have written presidential authorization to prosecute the war. This man must not answer to the General Staff but to the national leadership alone. He must command the war full time, not the Chief of Staff when he has time. The Chief of Staff must advise and provide overall command direction, but not manage the battle. The Joint HQ should become a proper 24/7 planning and war direction HQ, and this role should be removed from the general staff totally. The Joint HQ should be manned with mature officers and men who have fought in the ATO zone and who have been injured or retired and who understand battle. This HQ should be properly Joint with AF, SOF, National Guard, SBU and Navy officers not just Army, and must be the focal point of all intelligence to and from the battle area. Letting the general staff be involved in Donbas operations does not leave them time to do their proper role of force generation and capability development. In other words, they are mortgaging tomorrow for short-term gains today. The General Staff should concentrate upon future planning to develop the force capability and long-term strategy for tomorrow. They should be forced to use the budget properly and to cut out waste, especially unneeded manpower. They should have strict budget limits and their plans should be seen by president monthly and discussed in parliament. Put simply, their task should be improving the system for the next battle, not meddling in the current battle. A mobile tank reserve for the Corps Commander of at least a brigade size needs to be created and trained, and based at Dnipro. The creation of a fast-moving airmobile infantry battalion (anti-tank) based on all available helicopters as a national strategic reserve should be considered. This is needed as a time buyer in case of a surprise attack or unexpected breakthrough. This would be the ideal place for deploying and training the Javelin resources. It will answer the U.S. needs for security but at the same time be able to deliver force to the front line wherever needed in a quick time. Units in the battle area should be reshaped so that all brigades are balanced with a proper headquarters, alternate HQ and signals unit, including air liaison, three or four combat battalions of 350-550 men, engineers, artillery (including RSTA drones), close air defense, proper support logistics and military police. Ensure that brigades are complete at the front and stay so, and then only move brigades in and out of the battle area as complete units. A national reserve of two brigades is needed, to be located near Kyiv. All the units in the army not being used at the front today should be reshaped into combat or combat support units. All units that are not vital should be re-manned with mainly volunteers or conscripts, and the professional manpower retrained for the reserve corps. All battalion and brigade units should have trained intelligence staff and a proper J2 chain of command created, with intelligence staffs running from units through to the Defense Ministry. Passage of intelligence needs to be a two-way, not a one-way process. The support system for the army, which delivers people and training, has not changed as much as needed. Why this is so is a political topic, and a matter for another paper. But whilst the thinking in the staff remains Soviet, there will never be the fundamental changes needed. The key system change required is in leadership. The Soviet mentality is in control and punishment. This needs to be replaced by delegation, motivation and reward. The power-based system is a legacy hangover from the Soviets, and is not fitting for a new modern Ukraine. It kills the Army. Officers who rely on power and control must be removed, because they will never have the mental agility or wisdom to train troops for a fast moving battle, or to fight it. After three years of U.S. and UK support for the development of fighting ability, there still remains the serious issue of standardization in staff procedures, training and tactics. This is especially vital for any future mobile battles, because all battalion and junior leaders must have a common thinking framework for operations. This framework is still absent and there appears to be little attempt to create it. Advisers are simply not asked to help create it either. Soviet battle practices are still being taught in military schools. At present, the army has a shortage of officers. Young men without experience and with questionable education are taking command of companies or even higher (deputy battalion commander, battalion executive officer, etc.) The recruitment, promotion and training system has not been changed to meet the real need for leaders. At the same time, good quality officers are allowed to leave without encouragement to stay. One adviser even mentioned an example when an officer became a battalion commander in his second year after graduation but without combat experience. This is criminal and someone should go to prison for this act. All the professional military officer courses should be shortened to just eight months of combat training in the field in order to get the young officers into battle units as quickly as possible using the JROTC/ROTC model. Academies should be closed and the money saved. The U.S./UK training teams should be used to train all young officers and company commanders. Some of the best officers/NCOs should be brought back from the front for periods to join training teams and to lecture cadets and teach courses. Mobilization should be rethought. There needs to be a much more coherent process. The current Soviet system does not work. Recruitment should be for brigades and battalions by name, not just for the army. The leadership of brigades should stay the same, but each rotation should bring in fresh young soldiers and junior officers. Brigades should be rotated through the corps and national reserve so they can train for mobile operations and to higher standards. Brigades should be kept intact all the time so they become coherent units, and remain so. There should be no distinction between Army, Volunteer, Police and National Guard combat units for training and battle standards. Flexibility is required in terms of using manpower. The nation must doctrinally just have one force until the war is won. Officers and NCOs should be cross posted regularly to get the best lessons and experiences across the force. More National Guard should be seconded into fighting units. (Too many are standing around all day doing nothing useful). The best commanders should be chosen to lead the forces whoever they are. Remove brigade and battalion commanders who have no fighting spirit or were implicated in unethical or criminal behavior. Run a manpower audit on the forces and remove or drastically reduce any headquarters, units and servicemen who are not in battle, preparing for battle or resting after battle. Unused manpower eats money. Spend the money elsewhere. You need every penny. Be ruthless about cutting out waste. Make sure that all areas of work are “commanded” by a commander, not staffs. Change the nomenclature to the Western designations and authorities. Do not call someone “Chief of the Navy” but “Navy Commander” and give him/her the budget and authority to act – commanders must not rely on the dead hand of the General Staff. The same logic applies for the Army Commander, who must be empowered and tasked to deliver the army for combat. If he fails, remove him. Give them the budget and responsibility to recruit, train and maintain the army in the field for war. The General Staff are killing Ukraine’s army organization and possibly the nation’s future. They have not changed and improved as radically as they should have since the war started – change them for younger officers and more active young civilians. They have had their chance and failed. Be ruthless in these things – Ukraine’s national survival depends upon it. Split the current Chief of Staff post into three jobs; Chief of Defense, Chief of General Staff and Chief of Operations (For the Joint HQ) as soon as possible. This is also in the new defense law… No human being can do all three jobs properly at once, and the current Chief of Staff should not be tasked to do so. It is too much for one brain, and is strategically dangerous for the nation. These are simple changes, but they need urgent political action by government, as they will take serious time to implement. Time is being wasted, and time is the critical national resource in this or any war. The reason many changes have not taken place is because the general staff controls everything, has not yet developed western military expertise, and has few skills in how to order and conduct change. Activities that should take three to four days take months – if they happen at all. But more than this, the political desire to accept and praise the forces for their remarkable results so far is blinding them to the huge and vital steps still needed. British defense expert Glen Grant has been working in Ukraine since 2010 and almost permanently since Russia’s war against Ukraine started in 2014.